The 2012 unSUMMIT will be held on May 2-4, 2012 at the Hyatt Regency Orange County in Anaheim, California. Heck, that’s right in my backyard. Looks like I’ll be attending. I’ve attended the last two unSUMMITs; Atlanta in 2010 and Louisville in 2011. The conference is focused on barcoding at the point of care. While it’s not as big as the ASHP conferences, it’s full of people that want to learn about barcoding and patient safety. I found it valuable. Anyway, I received an email yesterday calling for speakers. I presented at the unSUMMIT last year and found it to be quite rewarding. The 50 minutes I spent on stage opened the door for a lot of post presentation discussion with colleagues. 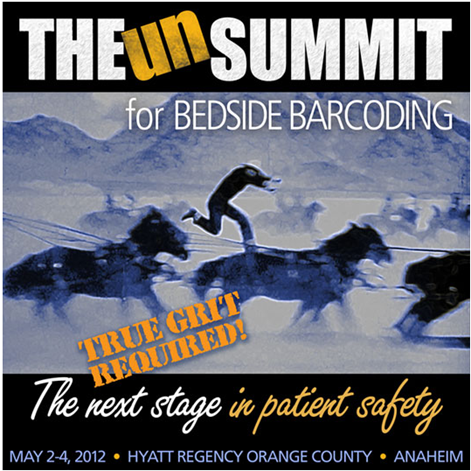 If you’ve gone through barcoding implementation at your facility, or are thinking about it, I would encourage you to not only attend the unSUMMIT, but consider presenting as well. It’s only through sharing information that we get better.